Between thought and expression, between the colors of the sunset and the eye of the beholder, in the liminal light of twilight we feel the atmosphere of Mercury retrograde. Mercury retrograde is a three week period in which we can surrender to opening our awareness beyond our usual habitual reactions, interfacing with our environment in different ways that surprise us. Mercury retrograde is the magical air we feel on our skin when we watch the sun disappear on the horizon with shifting hues, the shifting frame of perspective that invites epiphanies. In astrology, the setting sun is also a symbol for a death of self-absorption through the meeting of another in relationship or partnership. On October 4, 2014 Mercury will station retrograde at 3° of Scorpio (a sign of soul relationship), and move all the way back to 17° of Libra (a sign of social relations and social justice) on October 25, 2014. If we include the “shadow zone” before the retrograde station and following the stationing direct, between September 15 and November 10, 2014 Hermes is guiding us to a deepening of self-knowledge through our interactions with our environment and every relationship formed. Mercury stationing retrograde in Scorpio draws us into a spiral of Desire. Whether you have or have not already felt yourself pulled into an intense gravity of focus, an object or other drawing forth a surge of yearning from within, it will happen, and it will continue to be felt with expanding intensity in the weeks ahead. All the consequences of desire, all the lessons learned from wanting something out of reach, the questions dawning once we finally reach, acquire, or merge with our craving, will be part of our experience traversing through not only a Mercury retrograde, but a particularly shattering Lunar Eclipse and Solar Eclipse. Unless we have somehow done the miraculous work of lining our life up so that we are completely available to the focus of our desire, we will also come across all the limitations and habitual reactions of our past mind-frame restricting our ability to respond fully to the present passion. If you want to use astrology to help discern the nature of your desire, look in your chart to what house holds the first few degrees of Scorpio, and what aspects these degrees make in your chart. You can also then move clockwise in your chart to the middle of Libra and see what additional house or aspects in your chart will be further impacted as the Mercury retrograde continues. Research on habits has supported that the easiest time to break a habit is on vacation. This theory revolves around the concept that on holiday in a new environment, all the familiar surroundings we partially fixate our identity around are gone, the triggers of our habit have been removed, and we are more vulnerable to initiating a new pattern of behavior. This same concept goes well with Mercury retrograde: even though all of our usual triggers will still be in place, the atmosphere invites a different response to them. Additionally, as this retrograde cycle is initiated in Scorpio, there is potential for a death of old reactive patterns. Scorpio has the courage to enter the darkness where the past can be felt to our deepest core, without our usual defense mechanisms operating in the light of day. In this darkness our inability to possess or be present with the desire we yearn for burns from within with such magnitude that a release of past attachments can occur that ultimately opens us up to the real possibility of having or merging with our desire in the future. In Scorpio, the phoenix pulls us through the fear of abandonment, the terror of the focus of our past sense of security being destroyed, and Mercury stationing here facilitates the integration of the dualities within us like the light and the dark, the conscious and unconscious, in order to synthesize the birth of a new identity or presence in the world. This idea Virginia Woolf journaled about, that to close the door on the attachment of our possessions, to walk the streets in twilight among strangers, is an opening of our personality to the limitless depth of soul. 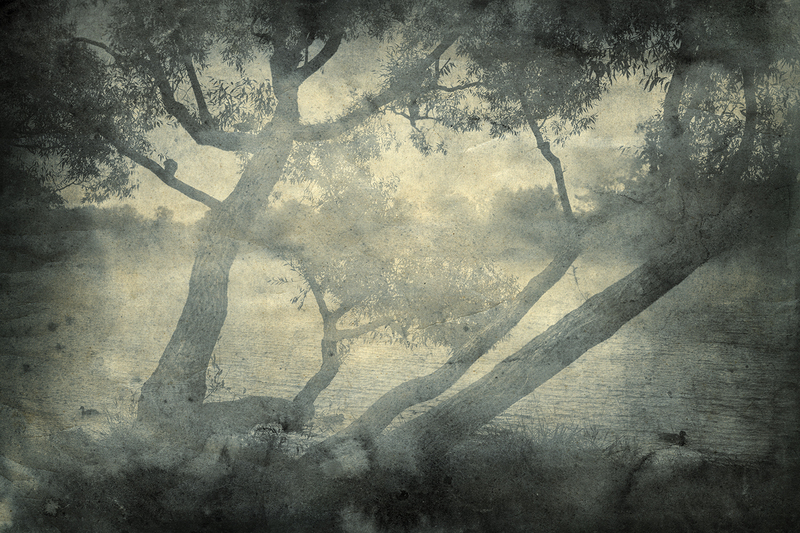 Mercury retrograde is likewise an opportunity to go for an evening walk under a canopy of dark trees, above a network of deep roots, into an awakening of who we are and where we desire to go. With those we share our most intimate essence with, there will be a more ardent interchange than usual, leading to an intensification in interaction that could be chaotic yet essentially revealing if we can avoid becoming so wrapped up in melodrama that we block our capacity to discern meaning. We do not want to be afraid of the dark, because there will be no avoiding the shadow or the dark night of the soul necessary to birth the insight we desperately need to actualize our purest passions. If there is anything we have been consciously avoiding from past relationships, the time of denial will be over as there will be no escape from suppressed thoughts and feelings emerging that will demand our attention. “Love goes toward love” William Shakespeare wrote in Romeo and Juliet, and when we fall enflamed in our heart’s rapture, we can feel like Romeo musing about Juliet, that the Other we desire is a “Beauty too rich for use, for earth too dear!” It seems that as much as we project and idealize an illusion in romantic folly, we negate a true desire of our soul for a love that terrifies us as much as it enchants our wildest passions. This is because great love dissolves and destroys our former sense of self, and we change and shift in the embrace of true love. Or, if we risk taking on the transformation of love, the work needed to sustain a relationship lovingly further challenges our sense of self, as it involves making compromises and listening to the needs of the Other. We get used to focusing on our old needs like a bad habit, instead of opening to how these needs can shift in every moment, guided by the wholeheartedness of desire. Since Mercury retrograde can facilitate shifting habits out of a changing place of perspective, we can realize which relationships we truly desire to focus on going forward, and cultivate the faculty needed for our mind to respond to the arising needs associated with our yearning. Since Mercury will move from the beginning of Scorpio back into the heart of Libra, and then forward again back into Scorpio, we will feel a surging ebb and flow of subconscious shadow in all of our relationships. In the eye of the present partner we may catch a glimpse of a childhood emotion, in a conversation with a passing passerby we may hear the echo of an issue that feels like it has been with us for an eternity. If we open to this process, there is something deep within to unearth through dialogue and attention to the needs of our relationships. In this way while our desires may be pulling us into a space of new perception, another major meaning of this Mercury retrograde will be Power. Where, when, and with whom do we feel powerful, where, when, and to whom do we give our power away, and how can we find the balance of feeling secure in our own power yet interacting with others so that we are not overpowering them or projecting our issues of power on to them. In addition, Mercury stationing at the beginning of Scorpio means that there are three generations of people on our planet right now who may be especially impacted subconsciously: those with Neptune at the beginning of Scorpio (1956-58), those with Uranus at the beginning of Scorpio (1974-76), and those with Pluto at the beginning of Scorpio (1983-85). 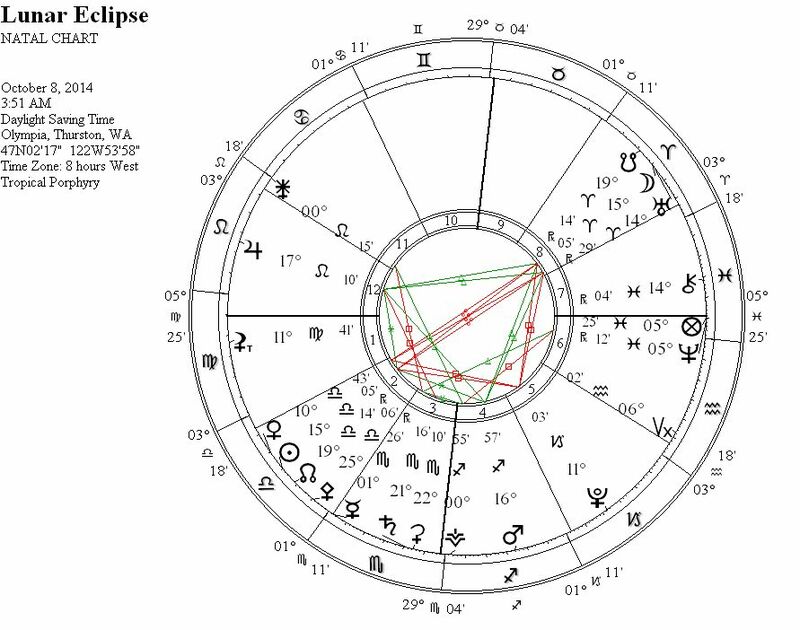 As there will additionally be a potent Solar Eclipse occurring at the end of October in these same degrees, right now with Mercury stationing retrograde at the beginning of Scorpio is a tremendous opportunity to sense what some of the coming changes may center around. In the space of retrograde Mercury we can be more sensitive to signs, symbols, and omens in our environment. While our relationships with other humans will come into play, it will also be about our relationship with the world. 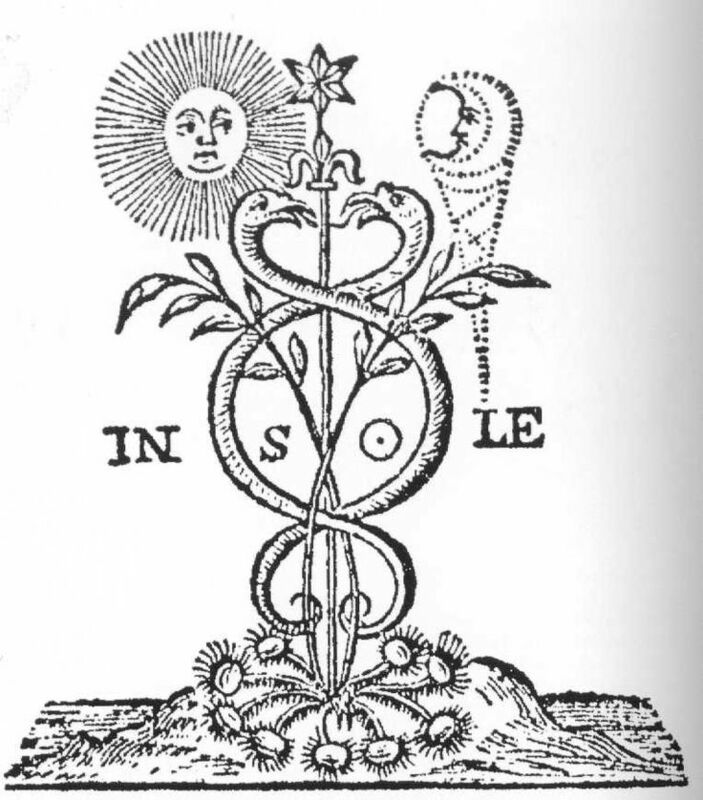 The more we take the “I-Thou” relationship of honoring the soulful nature of everything in our environment, and less the “I-It” relationship of viewing our surroundings as resources to meet our own needs, the more we will be able to recognize and realize the significant meaning this Mercury retrograde is bringing into our life. There is a good chance we will feel upside down, with our emotions in total disarray as our old identity and attachments dissolve within a liminal state. In this in-between we can find our way through reading the symbols and signs around us and balance within the flow of the life streaming in front of us. In the next month there will be obvious events and conversations that we know are pivotal; there will also be less obvious symbols surrounding us with a message to integrate if we keep our awareness open to them. Let the Mercury retrograde allow information to come in that you would normally rationalize away, and see where it takes you. 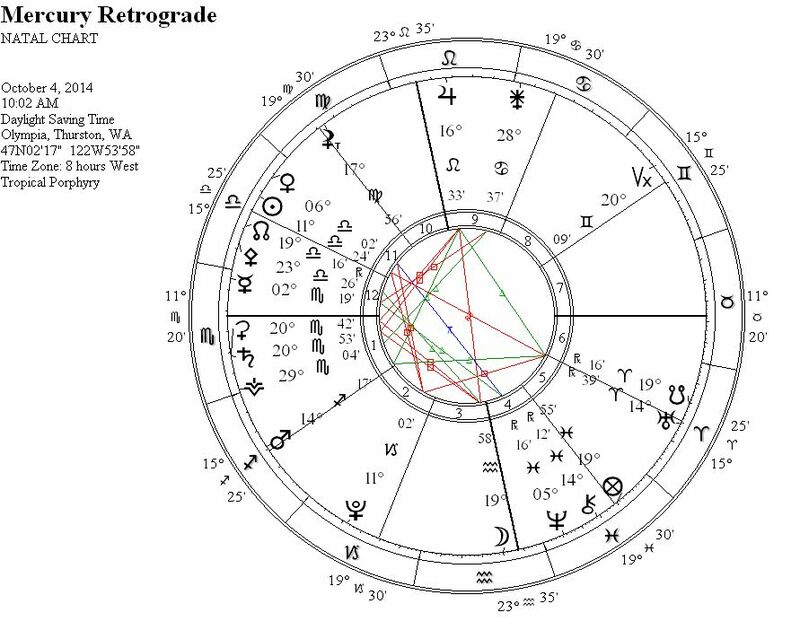 Here below is a chart for Mercury stationing retrograde: Uranus in Aries being involved in both a grand fire trine with Jupiter in Leo and Mars in Sagittarius, and a t-square with the Sun and Pluto, means that there is something especially Uranian about Mercury stationing retrograde. This is also a plutonic Mercury full of explosive energy that can blow up our previous perception of our world and what is occurring within it. Meanwhile, there is also a huge uplifting, dynamic energy that can synthesize meaning from both our impulses and our experience and weave them together into a tapestry that can seemingly transport us into a deeper dimension of perception, not unlike the magic carpets of fairy tales. The ticket for entry into this process involves a willingness to go into the dark and persist through fears or feelings of dissolution. Mercury will be descending into the underworld in Scorpio at the Lunar Eclipse, as the eclipse occurs around the time of Mercury’s heliacal set at sunset in which it disappears below the earth, becoming invisible. This is truly an extraordinary leap of a Lunar Eclipse managed by the structure of Ceres and Saturn united in the fertile darkness of Scorpio. Fittingly, the timing of this eclipse goes well with this being the initiation of the most magical of all the Mercury phases, the time in which Mercury becomes more of a mystical guide into our inner realm. This is the phase in which we can be more receptive to signs, omens, and symbols, and we can receive information intuitively more easily than rationally explain anything. In this time of Mercury as the Magician, Hermes guides us through accumulating and then releasing our old patterns of thought in preparation for a new vision. 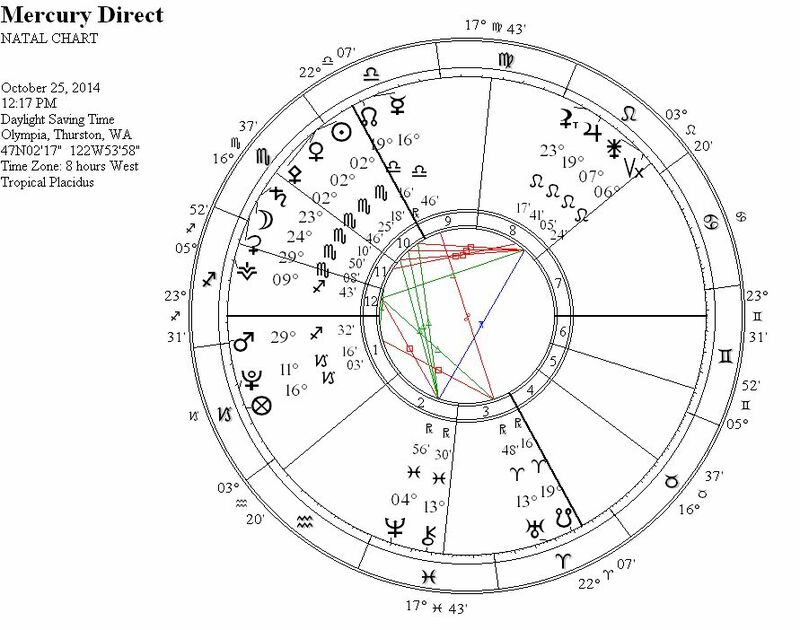 I don’t mean to suggest this will be smooth sailing for our Hermetic navigator, however, as Venus in Libra is in a harsh last quarter square to Pluto at this eclipse, adding additional climatic intensity of outer events forcing profound inner reflection. Eclipses are known to throw everything into disarray, and are not known to be times best for laying carefully designed plans. Yet this eclipse is so full of break-through aspects and force that it seems an air of liberation will be part of the chaotic atmosphere. It will be a time of sensing the power within a polarity of feelings, integrating the subconscious with the conscious, and owning our authority to heal the previous fracturing of our soul like Persephone. This will be a time to believe in our capacity to create a life aligned with our deepest soulful passions more so than the expectations of the consensus reality dominating our environment. The inferior conjunction of Mercury is a magical moment in which Mercury aligns with the Sun, in between our orbit and the fiery center of our solar system. This is a moment in which Hermes transmits a message from Spirit to us, and with Mercury in Libra we will have information to integrate about the Other our Self is in relationship with. However, Libra is not only about social relations but also social justice. As usual, there have been many stories involving oppression in the news and many traumatic events occurring around us whose story is untold by anyone other than the participants. What is frightening about our world is all of the abuse not covered by the media, that people suffer in isolation without anyone to reach out to for help. I do not mean to suggest that this Mercury inferior conjunction in Libra will be some sort of magic pill to heal all the societal ills in the world, but I do suggest that a window of insight will open giving us a very deep look into the source of our collective trauma and oppression. 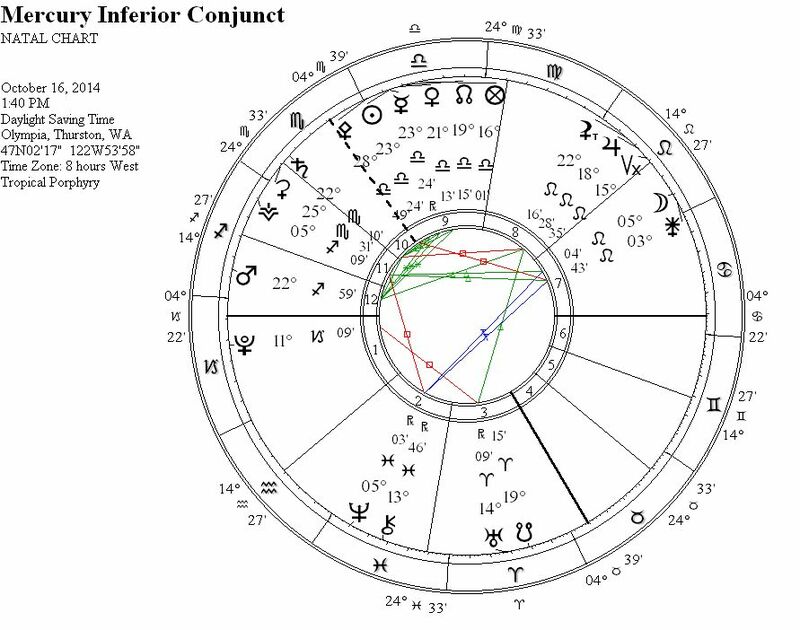 Nonetheless, this inferior conjunction will also be about our personal relationships and intimate partnerships, as the Leo Moon will be conjunct Juno and Venus, Mercury, and the Sun will all be conjunct in Libra. The insight we can gain will have something to do with all of the underworld mythology involving the pursuit of love and desire. Most of the stories involving a mythic figure being capable of descending to the underworld and back involve the character having such a powerful desire of love that they manage to somehow survive: Persephone, Psyche, Dionysus, Orpheus, Inanna, Ishtar, and Isis. We may be rocked and rolled over from where want and lust lead us, or from the desire and passion we attempt to repress or suppress, but in the end there is a more wholehearted sense of self in relationship to gain. This solar eclipse conjunct Venus at the beginning of Scopio is happening close to the same time as the Superior Conjunction of Venus with the Sun. This is Venus as Inanna following her descent into the underworld, and these Scorpio aspects bring to mind the Dark Goddess who will be with us during an especially intense balsamic moon phase leading up to this solar eclipse. In contrast to Mercury who is close to rising again at dawn as a morning star, Venus is on her way to becoming an evening star. The future promise of Venus rising again in our night skies with her brilliant white light is an apt symbol for inspiration that will eventually arise out of our current darkness, no matter the difficulties and disorientation we experience at this time. Traditionally Mars is also ruling this eclipse, and in modern rulership Pluto in Capricorn is ruling it. Either way, with Mercury stationing direct in the underworld at this time in Libra, and so ruled by Venus at the heart of her descent, this is a Solar Eclipse taking us into our core inner world. Change will come from within this core, sourced by our deepest desire, as we begin re-integrating the messages and information received from this Mercury retrograde cycle. It is an excellent time to set an intention for who and what we want to magnetize and attract into our life going forward from the inner vibration we are cultivating. However, this time will not just be about ourselves and our inner world, as this eclipse has clear aspects indicating a huge impact from the relationships in our life. Out of the challenging and uplifting experiences of this time, there appears to be a sharper sense of our essential nature to realize and embody. As Mercury finally stations direct, he turns to re-ascend to the upper world as a morning star harbinger of dawn. Hermes welcomes a new reality for us now, symbolized by Venus in Scorpio entering a new phase with the Sun, symbol of our Spirit. In addition, Pallas Athena in Scorpio remains conjunct Venus as Mercury stations, a sign that we could have greater access than normal to the ingenious insight available from Mercury stationing direct. The important quality to access the wisdom available here is honesty, and a willingness to take responsibility to both nurture our own needs linked to our desire, as well as listen to and respect the needs of others we are in relationship with. Amazingly in epic proportion, there will be a lunar occultation of Saturn in Scorpio occurring as Mercury stations direct, and following Mercury stationing direct the Moon will move on to a conjunction with Ceres. The myth of Persephone and Ceres seems strong in these symbols, and the compromise that Ceres managed to create enabling her to have her desire fulfilled of spending time with her daughter for half a year. This desire did not come easy, and followed inner disorientation, outer torment, and soul searching from the goddess. Yet as this myth served as a vehicle for rituals of epiphany in ancient times, there was also an inner revelation revealed, and so will there will be for us. Mercury will leave the shadow zone on November 10, 2014 at a time that Venus will be conjunct Saturn in Scorpio and Mars will be conjunct Pluto in Capricorn. As Mercury moves forward through Libra, focus on re-integrating all of the messages gained regarding our desires, relationships, and sense of self within relationships. The astrology of this time suggest there is something profound to build and cultivate from the rumination of our inner mind. Muchado, Antonio. (1902). Soledades. Translated by Eugenio Florit. Solnit, Rebecca. (2014). 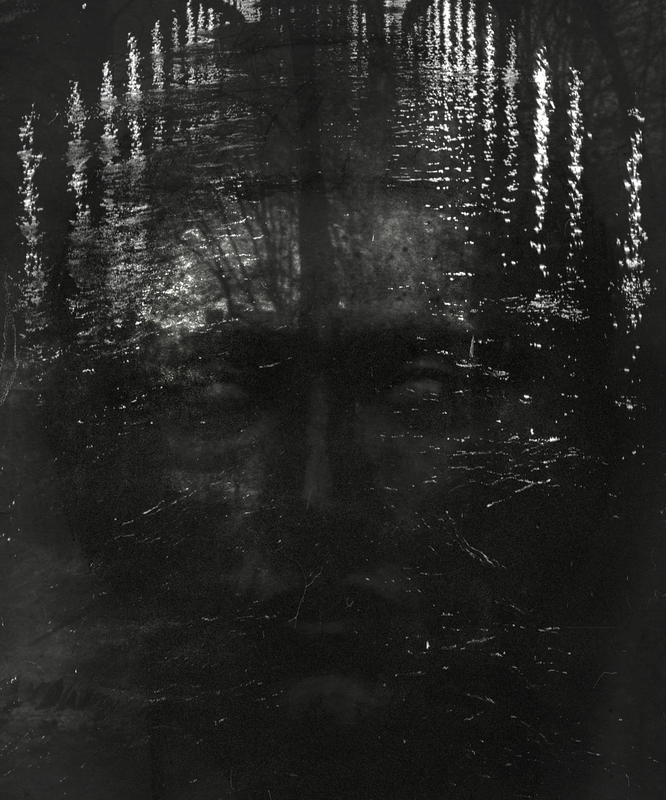 Woolf’s Darkness: Embracing the Inexplicable. The New Yorker. 24 April 2014.
only a ship’s wake in the sea. I think that Mercury retrograde is that time of the year when linear thinking is not working for us very well; it is the time when the neural paths become circular, sinuous or spiral-like with each twist coming closer and closer to the mystical centre. The time of Mercury retrograde is also when insights seem to come from on high and from deep below –from somewhere usually beyond our reach during our waking Mercury direct times. 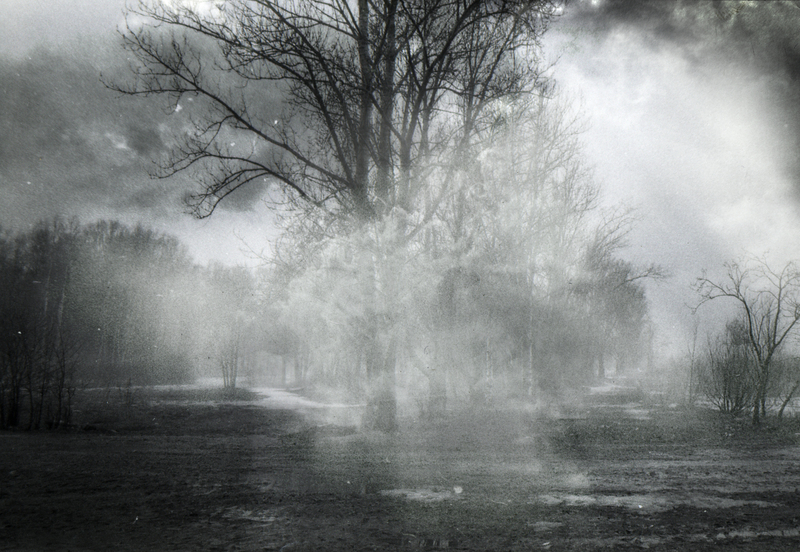 When Mercury goes retrograde we seem to step into the Dream Time. I was at an open-air arts market today and stopped at a Peruvian stall. Three Peruvian guys were displaying handmade jewellery. I just had to get a ring with serpentine (snake!) stone coming from the ancient Cusco region. I thought about ancient trading routes and about Aboriginal dreaming paths, which were also trading ways (http://www.qhatlas.com.au/content/aboriginal-dreaming-paths-and-trading-ways) I thought that this kind of exchanges are favoured by Mercury retrograde – the exchanges that take us deeper into our ancestral past and connect us with our archetypal collective roots (and routes). It is during Mercury retrograde periods that I usually come across various gems – I mean the one in my new ring, but also the one showcased by your beautiful writing. Thank you for sharing your perspective and the poetry of Antonio Machado evoking Mercury retrograde. I am happy to hear you found such a splendid serpentine stone befitting your finger. I love your play with language as usual, connecting Mercury retrograde with our ancestral routes and roots. Similar to you, I also found myself today swept up into events that like a dream seemed completely synchronous with the stationing of Mercury retrograde in Scorpio. One involved witnessing an acrobatic ballet performance in an outdoor park about salmon, how they remember their source in our pacific northwest creeks and manage to return to lay their eggs and die, after a seemingly impossible journey out into the deep ocean and back to their ancestral home. As you wrote, we will be traveling spiral-like into our mystical centre: I will take your thoughts with me, and am grateful for your sharing here. Thank you Kieron, I appreciate you taking the time to let me know you found something meaningful in my writing. I was just looking at your blog and notice you practice mindfulness. 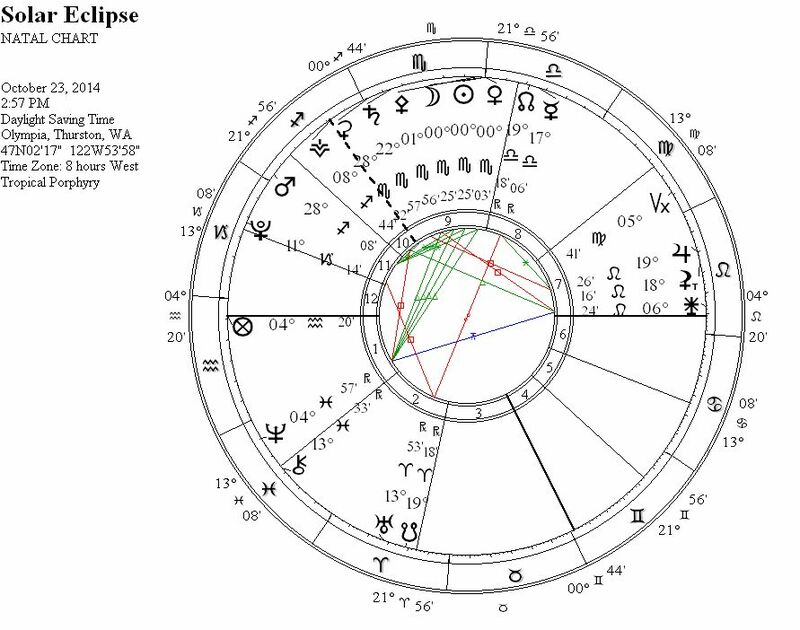 I think this will serve you well in this next week, as we are going to have an intense Solar Eclipse followed by Venus uniting with the Sun and then Mercury stationing direct. Yes, the art of Yaroslav Gerzhedovich is great.